The research institute of Vereinigung der Österreichischen Zementindustrie (VÖZfi - the Austrian Cement Industry Association) invited to a colloquium on the occasion of its 100th anniversary. The current trends in concrete technology of the Alpine country were demonstrated in 15 presentations. The research institute of the Austrian Cement Industry Association (VÖZfi) is supported by industry as well as subsidies granted by Österreichische Forschungsförderungsgesellschaft (FFG - the Austrian Research Promotion Agency) and the Austrian Cooperative Research (ACR). Whereas the FFG mainly supports fundamental research, the ACR primarily promotes application-oriented research. The colloquium takes place annually. This time, the 100th anniversary of the institute was furthermore celebrated. In the first section, DI (= Austrian abbreviation of Dipl.-Ing.) Stepahn Pirringer of the Vienna University of Technology presented a new, just 1 - 2 mm thick concrete composite material. It consists of a non-stressed perforated sheet reinforcement on which SCC is applied. The presentation of DI Dr.-Ing. Martin Zeiml dealt with the fire behavior of precast components made of double floor material, such as used for road surfaces in tunnels. The second section focused on the rheology of concrete and the development of new rheological measuring devices, in particular, for self-compacting concrete (SCC). Prof. Wolfgang Kusterle of the Regensburg University of Applied Sciences and Dr. Ameneh Schneider gave quite interesting presentations on these topics. In his short presentation, Dr. Jan Kluegge, an employee of BASF, indicated the possible application of building chemical additives to reduce the CO2 consumption in concrete production. The third section was quite practice oriented. Actually, two presentations dealt with new precast concrete products. DI David Wimmer of the Vienna University of Technology presented an innovative construction method of bridge girders made of precast concrete elements. These are large-scale lattice girders covered with a thin concrete wall. The hollow prefabricated bridge girders are poured with self-compacting concrete after erection. 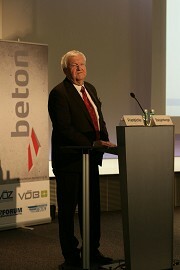 Engineer Robert Breithofen gave a lecture on behalf of Rehau GmbH concerning "energy tubbings". For this purpose, tube loops are integrated in the precast tunnel segments for thermal concrete core activation. The system is designed so as to allow the use of the existing geothermal energy as well as the waste heat from vehicles in tunnels with these water-filled tubes. However, active cooling is also possible with this system. The system thus could be used, for instance, for overheated subway systems of major cities such as in London or Singapore. The total of 15 presentations demonstrated the innovative power in terms of concrete technology of the Alpine Republic in an impressive way. The more than tight organization of the colloquium was also worth mentioning. The organizers restricted all speakers to just eight minutes, delaying the end of the event by only four minutes.